As the SCORPIONS prepare to hit the road in May for twelve North American headlining dates, the band has receruited former MOTORHEAD drummer Mikkey Dee to sit in on drums for James Kottak, who is currently on break while he seeks medical attention. SCORPIONS singer Klaus Meine states: “We would like to continue our Return To Forever tour with James, but we have to realize that his health is priority. We wish James a speedy recovery and he will be back to rock you later in the fall! We look forward to seeing all our fans this month." The band’s first release via the Century Media will be the Return To Forever Tour Edition, which comes opulently stacked with two brand-new live DVDs and is bound to make fans’ hearts leap for joy. The live DVDs are even more expansive, offering generous bonus material. Look for it everywhere now and direct purchase links are now live and listed below. 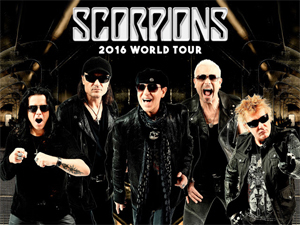 SCORPIONS kick off the 2016 US leg in May, beginning at Carolina Rebellion in Charlotte, NC on May 6th and including a Las Vegas residency with special guests QUEENSRYCHE.